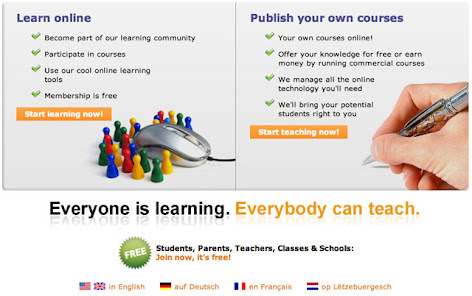 Since the reform of the teacher training at the newly created university in Luxembourg I have met a some teachers complaining that student teachers had been sent to their schools for practical training with their heads filled with theories about education, but lacking the most basic teaching skills. The answer to my question which kind of basic teaching skills they expected the students to have were not very clear to me and since I continue to ask myself: What is it that teachers do? And, how do you learn to become a teacher? But also, under what circumstances new answers to these questions could possibly be found. For years, in Luxembourg, student teacher's practical pre-service training was (and sometimes still is) based on a collaboration between a single teacher working as a tutor and a single student teacher or a pair of student teachers. In this constellation, lesson planning, interpretation of the curriculum and reflection on pupils development is most of the time part of the hidden work of the teacher because she/he usually doesn't stay in school to accomplish these tasks. What teachers do in the presence of student teachers, is performing in front of the classroom, managing and coordinating pupils' tasks, and maintaining classroom order. And this is mainly what the student teachers can observe. The tutor serves as a role model, a master who transfers her/his knowledge to the apprentice, an experienced practitioner who rarely needs to refer to a theoretical framework to justify his/her choices, and seldom struggles - in public - for solution in the face of pedagogical dilemmas. The job of referring to theory and discussing pedagogical dilemmas is most of the time left to the university lecturers doing supervision and visiting the student teacher once or twice during their teaching practice at the school. The concept of a teacher that a student teacher has constructed throughout the years during her/his own school life is more or less equivalent to the concept she/he constructs during practical pre-service training. This pre-service training cloning approach strongly depends on finding good "self-made" teachers serving as tutors and as role models for future teachers. The schools in which they act, only play a secondary role. Since more and more teachers have started to work in small teams (usually 3 to 5 teachers taking in charge an extended group of pupils) student teachers have the opportunity not only to copy teaching techniques from one isolated expert teacher but to witness the negotiations between teachers sharing ideas, preparing lessons together, defining common objectives and, hopefully, discussing the progression of their pupils and if there is enough time left, also discussing their personal understanding of their pedagogical mission. This insight in the off work is possible because when working in teams, teachers stay in school more often to do their preparation work instead of leaving the campus. Here student teachers can be present and develop a more realistic concept of what teachers do, when they don't "teach". But still, what we have here, is a reproductive cycle, a kind of single-loop learning, through which teachers or team-teachers are "made". What is missing, is the opportunity for student teachers to be part of a deeper reflection in a school community on educational practices and purposes. They need to experience that the process of developing an explicit shared school culture transforms the teachers themselves. This can be the case in schools evolving as learning organizations, where single teachers and teacher teams are transformative actors pursuing a common goal. which is, developing their school, and at the same time, developing themselves, collaboratively. In such a school teachers meet not only to plan and organize but to controversially discuss their approaches, their key concepts and beliefs, as well as their relationship to teaching and learning. Here new patterns of teaching behavior and reflection can emerge which cannot be reduced to the change of a handful teachers' behaviors, attitudes and understanding alone. If we want schools to evolve faster and better than today, becoming teachers should be exposed to communities of teachers articulating multiple perspectives on what learning and teaching means to them in general and in the specific context of institutionally organized education. Even more important, student teachers should not learn from but learn with teachers arguing in favor of their specific viewpoints by referring not exclusively to teaching experience or personal preferences, but also to their own learning biography and, of course, to theory and research. But can this really be achieved if teachers are mainly used to refer to their experience and if they tend to ignore or even to depreciate theory and research? I don't think so. That's why we should stop keeping one process secret to the eyes of one of the actors and develop a practice school model where pre-service, in-service training and organizational development are strongly connected and not approached separately. In a framework where the making of teachers and the making of schools are deeply connected, theory will be easier recognized as being inevitable. But what about research? 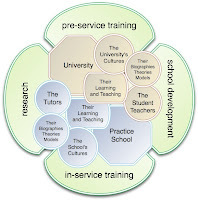 Certainly there is great potential to do research in practice school where pre-service training, in-service training and school development are intentionally interconnected. But there is also a need to discuss the purpose of research and the types of research that should be in use. If the way to find new teaching patterns is not build on a behaviorist framework where mainly copy-paste or input-output processes are at work but on a complex adaptive system approach where self-organization gives room to emergence, creativity and unpredictability, the role of research is very different too. It tends more to describing the conditions under which a certain type of teaching and learning may be possible than to identifying in a linear way the link between specific actions and its presumed outcomes. I would like to conclude by affirming that a best practice school is more than a school with good scores and some highly motivated expert teachers where universities can sent their students to. Not only student teachers, but all actors involved, need to understand that teachers are not made during 4 of 5 years of higher education and by passing future teachers through some kind of cloning processes, but through an ongoing dialectical rearrangement of ideas, references and practices. To find new answers to questions like, What is it that teachers do? And, how do you learn to be a teacher? we have to change the circumstances under which these questions are posed.